Colombo, Mar 20 (PTI) Sri Lanka has made “poor progress” by implementing only 6 of the 36 commitments it made as part a UNHRC resolution adopted in 2015 to address human rights concerns, a local think tank has said, ahead of the UN body’s review of the island nation’s progress in honouring its pledge. In a critique released by the Colombo-based Verite Research, Sri Lanka has partially fulfilled a few commitments such as release of military-held land while showing no progress on majority ones. Sri Lanka co-sponsored a United Nations Human Rights Council (UNHRC) Resolution in September 2015 which made it committed to fulfil a range of measures dealing with human rights, accountability and transitional justice. Critics have accused Sri Lankan government forces of human rights violations during the three-decade-long Tamil separatist conflict that ended in May 2009 with the killing of rebel Tamil Tiger chief Velupillai Prabhakaran. The Tamil Tigers were fighting for a separate state for the Tamil minority carved out of the north and east of the Sinhalese-majority island nation. Recently, it came under international pressure to implement fully the measures identified by the UNHRC after the United Kingdom and Germany tabled a resolution at the UN body in Geneva. “Four years after co-sponsoring Resolution 30/1, the Sri Lankan government has fulfilled six out of 36 commitments on reconciliation, human rights and accountability,” Verite Research said in the critique, released ahead of the UN rights body’s review of progress of the resolution implementation which is to happen later Wednesday in Geneva. Three commitments saw an improvement in their implementation status since February 2018. These improvements resulted from the operationalisation of the OMP (The Office on Missing Persons), the enactment of legislation to set up an Office for Reparations, and the criminalisation of enforced disappearances. 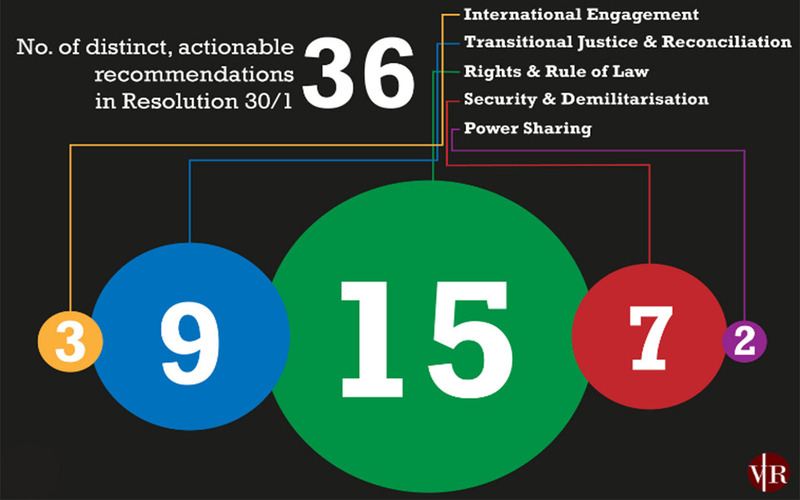 “Most commitments contained in Resolution 30/1 saw no change in implementation status over the past year. Commitments that remain partially fulfilled include the release of military-held land, the review, repeal and replacement of the PTA and investigations into attacks on journalists, religious minorities and civil society actors,” the think-tank said. “Commitments that remained in the ‘poor progress’ category include those on security sector reform and demilitarisation, devolution of power and protection of witnesses and victims of crime,” it added. The think-tank also said that the government has even lacked in setting-up the judicial mechanisms. “The government has made no progress thus far in fulfilling its commitment to set up a judicial mechanism with a special counsel and foreign participation to investigate violations of human rights and international humanitarian law,” it said. The observance of Verite Research, which echoes the Tamil and rights group’s pleas, urged that Sri Lanka should not be permitted anymore time to fulfil its obligations by the resolution given the lack of commitment shown. “The government lost ground in the fulfilment of one commitment – to ensure effective operation of Provincial Councils –as a result of continued delays in holding provincial council elections,” it said. On Wednesday, the Council will consider the report of the Office of the United Nations High Commissioner for Human Rights (OHCHR) on Sri Lanka and discuss the implementation of Resolution 30/1.